After Tommy Ladnier’s death, it fell upon Mezz Mezzrow to take care of Tommy’s belongings and bury him. The funeral was set to Friday June 9, 1939 at Frederick Douglass Memorial cemetery, Staten Island, an African American cemetery. Frederick Douglass, born Frederick Augustus Washington Bailey c. 1818, died February 20, 1895, was an American abolitionist, editor, orator, author, political leader and reformer. He was the most prominent African-American of his time, and one of the most influential lecturers and authors in American history. Born in slavery in Maryland, he was separated from his mother who eventually died when he was nine years old. Douglass never knew his white father. His owner’s wife broke the law in teaching him to read and write. At the age of 15, he was lent out to a cruel “slave breaker” but fought back; the master was ashamed at being beaten and never said anything. In 1838, Douglass succeeded in getting the sailor's papers needed for his escape as a free black and ran away to New Bedford, Massachusetts. In New Bedfordhe attended Abolitionist meetings. Douglass is most well-known for his autobiography, “Narrative of the Life of Frederick Douglass, an American Slave,” published in 1845. Critics attacked the book as unrealistic, not believing that a black man could have written such an articulate work. It became a bestseller and within three years had been reprinted nine times and translated into French and Dutch. This success had an unfortunate effect when his friends and mentors became afraid that the publicity would draw the attention of his ex-owner who could try to get his “property” back. They encouraged him to go on a tour to the British islands in 1845, and where he spent almost two years giving lectures. Douglass was able safely to return to the U.S. only when two Englishwomen purchased his freedom from his former owner Auld, for $710. On December 5, 1846, Douglass was legally a free man. 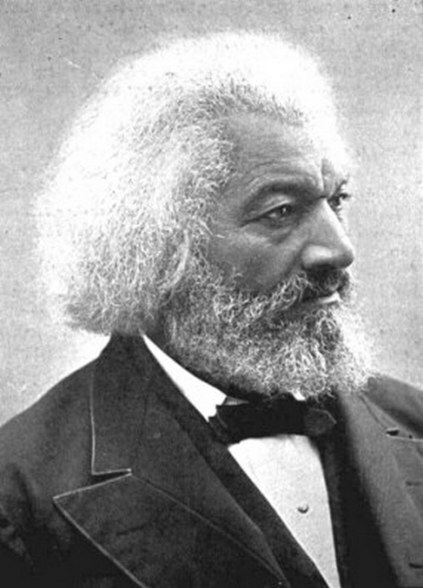 Douglass became the publisher of several newspapers and conferred with President Abraham Lincoln in 1863 on the treatment of black soldiers, and with President Andrew Johnson on the subject of black voting rights. After the Civil War, Douglass held a number of important political positions. Douglass's wife Anna Murray Douglas died in 1882, leaving him in a state of depression. In 1884, he married Helen Pitts, a white feminist and daughter of an abolitionist colleague and friend of Douglass. Frederick and Helen faced a storm of controversy because of their marriage and they stayed in Europe1886 and 1887. Frederick Douglass died of a massive heart attack in WashingtonD.C.in February 1895. The entrance to the Frederick Douglass Memorial Park is situated at 3201 Amboy Road, Staten Island. The first burials were in 1935. 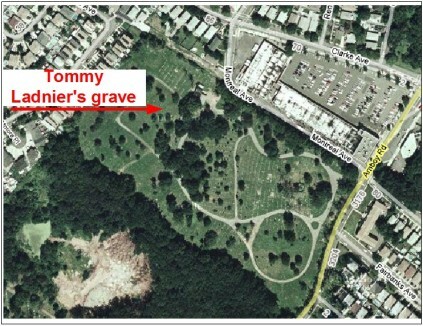 Tommy Ladnier’s grave has No 58, in range 13 of Section H. Despite all the efforts from Mezzrow and his friends, the grave was left unmarked for almost 70 years. Describing the funeral one week earlier, the Chicago Defender mentioned other musicians probably contributing to Tommy’s funeral as shown in the clip in the left marginal. There are some surprising names given in this item but even more astonishing are the names missing. Neither Mezzrow nor Chicago Defender mentions Sidney Bechet, but of course he could have contributed. It must be assumed that there were many guests at the funeral and that Chicago Defender only mentioned some of them at random. Bechet recorded for Blue Note the day before the funeral, on June 8, 1939. At that time, he recorded Tommy’s Blues and Summertime, one of his finest solo recordings ever, in spirit dedicated in homage to Tommy. 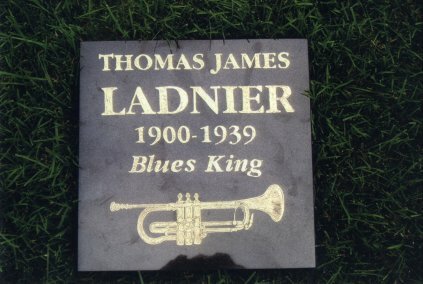 Almost 69 years to the day after his death, a 30 cm square grave marker was placed on Tommy Ladnier’s grave. The material is Nero Granite and has no grain structure. The piece is 13mm thick and is attached to a concrete base. The marker was engraved by Bob Sprauge and was placed on site by Bob Lang. Their contributions are heartily acknowledged. Generous funding for the marker was raised from Dan Vernhettes, Boss Quéraud, Francis Guéro, Paul Bocciolone Strandberg, Nils Gunnar Anderby, Bo Scherman, Claes Ringqvist, Chris Hillman, and Bo Lindström.